The Municipality of Jose Panganiban is one of the municipality in the province of Camarines Norte, Philippines. It was formerly known as Mambulao, from the word “mambulawan,” which means bountiful in gold. In December 01, 1934, it was renamed to honor Jose Maria Panganiban, the great hero of Bicolandia, Jose Martin Panganiban Y Enverga. If you opt to see the whole 360-degree view of the town, you have to visit Turayog Place located in Brgy. Luklukan Norte, Jose Panganiban, Camarines Norte, Philippines. Another fine sand, few houses and most especially, not so crowded beach Bulalacao Beach. It is located at Luklukan Sur, Jose Panganiban, Camarines Norte, Philippines. It so nice to experience walking and soaking on the beach. Hopefully, we could back again since we only have a limited time during our visit. 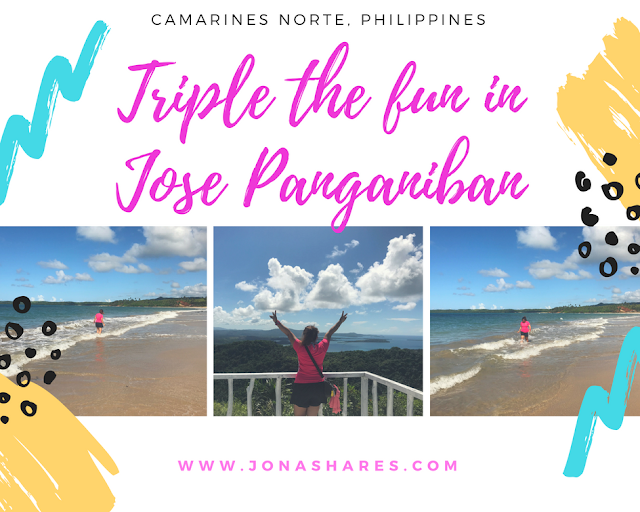 There are other islands to visit in Jose Panganiban such as Parola Island which is also known as the pink beach in Camarines Norte. Though we were not able to visit the island due to the weather. I guess, there would be more reason to go back, right? Let me know in comments if you have other suggestions on places to visit around Jose Panganiban, Camarines Norte. I love that Bulalacao Beach isn't crowded with development. It's so nice to walk out onto an open beach and watch the ocean waves cascade. That looks absolutely gorgeous. I really do need to get to that part of the world because it looks like there's just so much to explore. I enjoy your posts because they give me such a great idea of what it is like there. This trip looks amazing.The Philippines is on my bucket list of places to visit. What a beautiful area. I need to get here one day. I always love to be near the water. Oh wow this looks like such a lovely place to visit - that beach looks amazing I would 100% love to spend some time soaking up the sun there. One of my best friends is originally from the Philippines. This beautiful location is on my bucket list! This beach looks like heaven. The water and sand looks so pure and beautiful. I would love to visit! I'm almost embarrassed to admit this, but I had never even heard of this place! But it looks AMAZING! That beach!!! I want to go there! Wow, that Beach is absolutely beautiful. I would love to spend some time there someday. My best friend is from the Philippines. Her mother goes and visits ever couple of years. This makes me want to tag a long! Such a stunning place to visit! I have always wanted to travel to the Philippines but have not made it there yet. It seems like a wonderful place to visit with culture, people, food and nature. Gorgeous! I have never been there and definitely this is a wonderful place to visit most especially that beautiful beach. I will add this to my bucket list and hope to see this place sooner! Looks like a loads of fun there. I could only wish to ever go there in my lifetime. I have never traveled to the Philippines. You have shared so many wonderful places, I would love to take an extended vacation and visit them all. The more BB reads about the Philippines, the more she wants to visit. It's definitely getting higher on the bucket list when she sees sights like these. Gracias.